Police Booking Sheet from the Bureau of Identification, Police Department, New Orleans, Louisiana for Joseph V. Normandie, arrested on January 1, 1927. Sheet features original mug shots, fingerprints and signature. Sir George Alexander; born George Alexander Gibb Samson (June 19, 1858 – March 15, 1918), English stage actor, theatre producer and theatre manager, vintage silver print postcard. Original Police Booking Sheet from the Sheriff's Office, Phoenix, Arizona for Raymond Damron​​, arrested on January 10, 1931. Notice features original mug shots, fingerprints and signature. Frederick Douglass (February 1818 – February 20, 1895), prominent 19th century African-American social reformer, orator and writer, authentic, autographed vintage partially-printed document (DS), dated January 21st, 1886. David Warren "Dave" Brubeck (December 6, 1920 – December 5, 2012), American jazz pianist and composer, considered to be one of the foremost exponents of cool jazz, authentic autographed vinyl LP of the 1966 release "Dave Brubeck's Greatest Hits​." 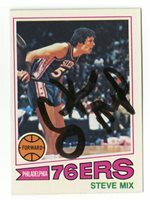 Steve Mix, former NBA player who spent his career split between the Detroit Pistons and the Philadelphia 76ers, authentic, autographed vintage 1977-78 Topps basketball card. Flavor Flav - Public Enemy - Autographed 3x5 card. Hand signed in-person. Fine condition. Police Booking Sheet for Patsy Rotondo​, arrested on June 1, 1932 for "Petit Larceny." 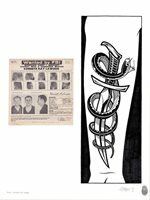 Sheet features original mug shots, fingerprints and signature. North Eastern Railway - 19th Century United Kingdom Stock Document. From "John P. Sowerby." Cy Olson Office Hours Daily Single-Panel Comic Strip Original Art (King Features Syndicate, 1959). A wonderful panel showing off Olson's persistently funny and cynical gags about corporate sweatshop life. Living Colour, American rock band, authentic autographed trimmed glossy photograph, hand signed by Corey Glover. Steve Mix, former NBA player who spent his career split between the Detroit Pistons and the Philadelphia 76ers, authentic, autographed vintage 1978-79 Topps basketball card. Police Booking Sheet for Robert Pinex​, arrested on January 1, 1932 for disorderly conduct. Sheet features original mug shots, fingerprints and signature. Cy Olson Office Hours Daily Single-Panel Comic Strip Original Art (King Features Syndicate, 1960). A wonderful panel showing off Olson's persistently funny and cynical gags about corporate sweatshop life. Leo Fitzpatrick, actor and artist, authentic, autographed film poster glossy 8x11 reproduction photograph. This photograph is hand signed by Fitzpatrick who played 'Telly' in the indie classic film "Kids" by Larry Clark. 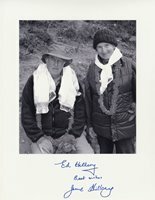 Sir Edmund Hillary (July 20, 1919 - January 11, 2008), world-renowned New Zealand mountaineer notable for his historic summit of Mount Everest, authentic, autographed 11 x 14 inch glossy photograph. Additionally signed by his wife June Mulgrew Hillary. J. Wurzbacher & Sons Plumbers and Gas Fitters, Lawrence, MA, signed letter on official letterhead, dated September 24, 1915. Signed "J. Wurzbacher & Sons."